Farmland connects us with our agricultural heritage, and through farming, allows us to connect to each other, the land, and the seasons. As development spreads across the Middle Rio Grande Valley, our farmland treasures are vanishing. To preserve this dwindling resource, the City of Albuquerque has acquired five farms to manage as Major Public Open Space. Albuquerque's Open Space Farmlands provide us with unique opportunities to enjoy farming and farm landscapes, educational activities, wildlife, recreation and special events. In 1977, the City of Albuquerque's Open Space Division acquired its first piece of farmland: the 97-acre Candelaria Farm. This farm is located on the north side of the Rio Grande Nature Center. To maintain the farm landscape, the City has contracted Scott Rasband, owner of Rasband Dairy known locally for rgBH-free milk products, to grow crops for his dairy cows and for visiting wildlife such as hundreds of sandhill cranes and Canada geese that arrive to feed at the farm each fall. Wildlife enthusiasts can view the bountiful flocks of cranes, geese and other water wildlife that take up residence seasonally or year-round at the Candelaria Farm wetland from the viewing blind at the Rio Grande Nature Center. However, in order to protect wildlife, public access to the farm is limited to guided programs. Educational activities for school children are scheduled from March to October, so as not to disturb the avian visitors. The City of Albuquerque is in the process of creating a resource management plan for the 167-acre Candelaria Nature Preserve, and we're asking for your input! Please visit the Candelaria Nature Preserve Resource Management Plan page to learn more. 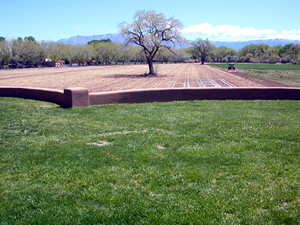 Los Poblanos Fields owes its existence to the citizens of Albuquerque. Citizens purchased the 138-acre North Valley farm for Open Space in 1997, through a temporary Quarter Cent gross receipts tax. The Village of Los Ranchos, Bernalillo County, and the State of New Mexico also donated generously to the acquisition. Rio Grande Community Farms (RGCF) and Rasband Dairy continue the farming tradition at Los Poblanos, and use 25 percent of the farmland to grow crops to feed visiting waterfowl during the winter. 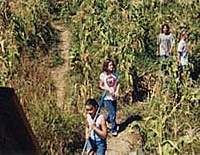 Los Poblanos Fields also offers the public a variety of popular special events and programs including the annual corn maze, the community garden, and hands-on educational activities organized by RGCF. Since 2011, Los Poblanos Fields is also the local site for the celebration of World Tai Chi Day. The farm is open to the public to enjoy wildlife viewing, picnicking walking, jogging, bicycling and horseback riding. Vehicle access is west of 4th St on Montaño Rd. and north on Tierra Viva Rd. Parking is available in the gravel lot on the west side of Tierra Viva Rd. 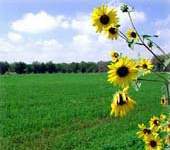 The Hubbell Oxbow Farm is an 87-acre parcel of South Valley farmland. The property, located just outside the Albuquerque City limits, is bordered by Coors Blvd on the east, the Albuquerque Metropolitan Area Flood Control Authority (AMAFCA) detention basin on the west and south, and Rio Bravo Blvd on the north. The Open Space Division contracts a local farmer to keep the land in agricultural production. The property does not offer formal access. The City acquired this 20-acre North Valley farm as Open Space in 1998. On this property, the Open Space Division preserves a cottonwood bosque, and farms a portion of the land for wildlife crops. In the future, this Open Space may provide formalized pedestrian and equestrian access to trails in the Rio Grande Valley State Park. The property is not currently open to the general public to protect wildlife habitat. However, the farm can be viewed from the parking lot for the paved trail along Paseo Del Norte. One of the best places for watching Sandhill Cranes is the Open Space Visitor Center, located adjacent to a 24 acre farm managed by the Open Space Division for wildlife. Since its official opening in 2006, the Visitor Center has become a haven for wildlife photographers, as it allows for unique views of Sandhill Cranes and other bird species, with the spectacular backdrops of the Sandia Mountains and the Cottonwood forests of the Rio Grande. The farm itself is closed to the public as it is managed as a wildlife preserve.